The first establishing shot in the film follows a subjective shot, consistent with Bergman form that emphasizes subjective experience even while thematically concerned with big ideas like God. Persons, characters, repetition, and coldness dominate the opening Eucharist scene. Much of it is shot in a long take, highlighting the lifeless and static rite being “celebrated.” The body of Christ and the crucifix occupies a central, if background, spot behind the priest’s desk. It often aligns with him and suggests all kinds of possible meanings. Easy to speculate on this, difficult to pinpoint. His assistant is disabled, and the priest himself is sickly, not unlike his counterpart in Bresson’s Diary of a Country Priest. But whereas that priest was physically dying despite his doubts, this priest is forced to stay alive. Important last name of Mr. & Mrs. “Persson,” and also his name, “Jonas.” Could there be a more generic name than “John Person”? The man is not presented as an anomaly, but rather as something that defines the state of being in the world. He and his wife are some of the only parishioners we see. His suicide can’t be stopped, least of all by the nearly-suicidal priest. His wife is hardly surprised, and the priest provides no comfort. “We must trust God,” he tells the man, unable to make eye contact. The priest’s name is “Thomas,” a doubting Thomas if there ever were one. The church’s decor is morbid both in his office and in the sanctuary, as if all it can offer is an open acknowledgement of death’s inevitability but without a cure. This is all crucifixion with no resurrection. An extremely long take when she reads the letter, this time without glasses. 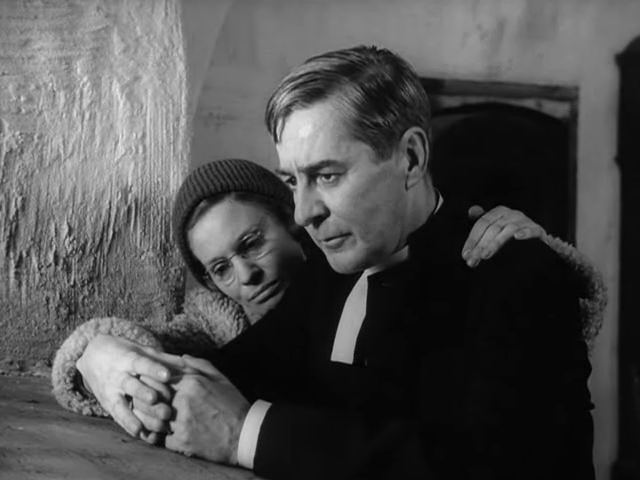 The priest wears glasses at the beginning of the film, but by the end he’s without them. Is his vision improved, spiritual or otherwise? His coughing fit while insisting, “I’m fine!” betrays his denial. Marvelous: that long scene when Thomas and the other men help fetch Jonas’s body near the river, so silent, so stagnant, so little camera movement, and ending with Thomas alone there. The film ends with lines from Isaiah/Revelation: “Holy, holy, holy is the Lord God Almighty. The whole earth is full of his glory.” Whether a liturgical normality or not, Bergman’s choice to end here is significant, but it’s difficult to say how. Is he ending the film on a doxological note, a sort of fideistic or Kierkegaardian leap into faith? Or does the doxology act ironically, juxtaposed with the ongoing doubts and cold stagnancy of the worship? 16 Sep	This entry was published on September 16, 2014 at 2:32 pm. It’s filed under 1960s Cinema, Ingmar Bergman, Swedish Film and tagged art film, cinema, film, Ingmar Bergman, movies, Swedish film, Winter Light. Bookmark the permalink. Follow any comments here with the RSS feed for this post.